Last weekend I celebrated my birthday the only way a tech guy should – by dropping off the grid and enjoying the great outdoors, mostly sans internet connection. When I came back online I was greeted by that familiar and welcome scene – lots of messages from family, friends and the occasional distant acquaintance wishing you happy birthday. 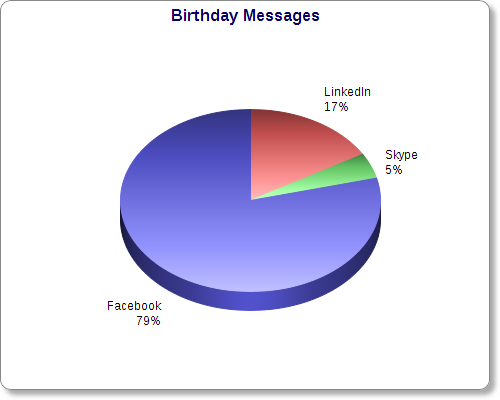 While Facebook has long been king of the birthday message, I was surprised to see just how many birthday messages I received this year via LinkedIn. While last year I received one birthday message via LinkedIn, this year I got 22. For a professional social network, and for a person who’s birthday falls on Labor Day (a public holiday here in the US) it was really surprising to see the difference a year makes. Anyway, here’s the split in graphical form. It will be interesting to see what happens next year.